Event #35: $5,000 Eight-Handed No-Limit Hold'em at the 2014 World Series of Poker, which attracted 550 players and created a prize pool of $2.585 million, was originally scheduled to be a four-day event; however, things moved a little faster than expected on Day 3 and a winner was crowned. 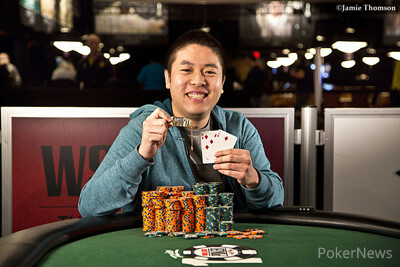 That man was Brian Yoon, who captured a $633,341 first-place prize and his second WSOP gold bracelet. 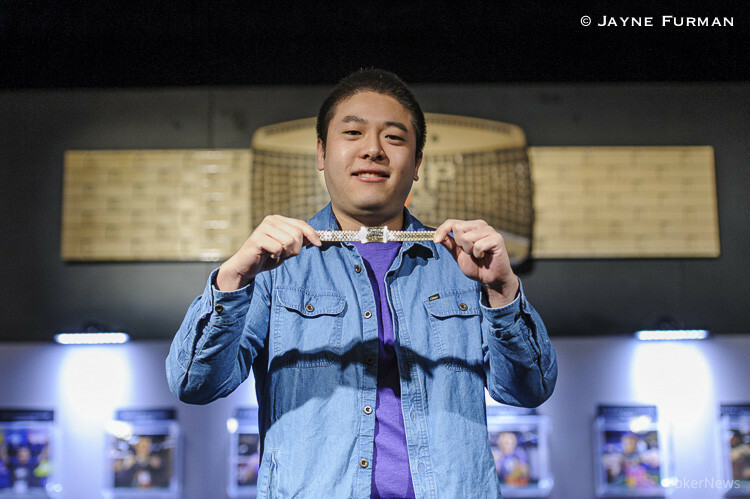 Yoon may be familiar to poker fans as the man who topped a massive field of 4,756 players in last year’s $1,111 buy-in Little One for One Drop event for a first-place prize of $663,727. With this win, Yoon, who is two for two in WSOP final-table wins, brings his lifetime WSOP winnings up over $1.4 million. Day 3 began with 23 players, and it didn’t take long for some to hit the rail. Among the early eliminations were Olivier Busquet (23rd - $18,095), Eric Froehlich (22nd - $18,095), Ravi Raghavan (21st - $18,095), and Jeff Madsen (20th - $18,095). Madsen began the day as chip leader, but he lost a good portion of his stack straight out of the gate. Then, in Level 21 (5,000/10,000/1,000), he three-bet all in for 147,000 from the big blind after Yoon had opened for 20,000 from the small blind. Yoon called and was in a dominating spot with the to Madsen's . The board ran out a clean , and the 2006 WSOP Player of the Year made an unexpected early exit. From there, 11 players followed him out the door before the final table was set. Among them were Matt Davenport (18th - $18,095), Sylvain Loosli (16th - $21,946), Sam Stein (14th - $27,013), David Peters (12th - $33,734), and Sam Trickett (11th - $33,734). Tony Cousineau was the first final-table casualty after his pocket nines failed to hold against Yoon’s king-queen on Hand #43. With that, Cousineau added to his record streak of 63 WSOP cashes without winning a gold bracelet. On Hand #49 of the final table, Timo Pfutzenreuter exited in seventh place when his pocket sevens fell to the of Mustapha Kanit after an ace appeared on the flop. Another ace on the turn left Pfutzenreuter drawing dead, and he took home $71,940 for his seventh-place finish. Nine hands later Kanit would eliminate Dan Smith when his own pocket sevens held against Smith’s , but seven hands later Kanit would be on the rail after a failed bluff against Yoon. 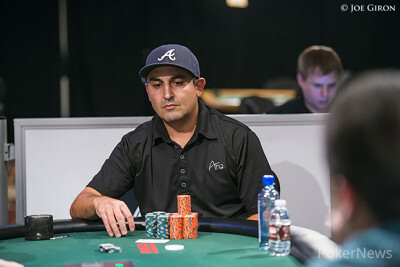 Four-handed play last quite awhile, but eventually the blinds got big and Josh Arieh was able to eliminate two players in five hands. The first was Ardit Kurshumi, who failed to win a race for his tournament life, and the other was Josh Bergman, who failed to overcome Arieh’s with the . Kurshumi and Bergman were felled in fourth and third place for $176,684 and $246,169, respectively. Heads-up play between Yoon and Arieh began with the two near even in chips, and they were pretty deep. It could have been an extended affair, but instead it lasted just 19 hands. During that time, Yoon gained momentum, opened up a chip lead, and finished off his opponent after flopping a flush. Congratulations to Brian Yoon, winner of Event #35: $5,000 Eight-Handed No-Limit Hold'em! Hand #142: Brian Yoon raised to 100,000 on the button and Josh Arieh folded. Hand #143: In what would be the final hand of the tournament, Arieh opened for 100,000 from the button and Yoon called from the big blind, which brought about a flop of . Yoon checked, Arieh bet 75,000, and Yoon check-raised to 240,000. Arieh called to see the and Yoon bet 350,000. Arieh took a few moments before raising all in for 1.63 million and Yoon snap-called. Arieh put it in with a pair of aces and the ace-high flush redraw, and he needed to hit the latter as Yoon had flopped a flush. Both rails were on their feet to watch the dealer burn and put out the . Arieh missed and was eliminated in second place. While Arieh missed out on his third bracelet, he will take home a $391,575 consolation prize. Hand #140: Brian Yoon raised to 100,000 on the button and Josh Arieh folded. Hand #141: Arieh raised to 100,000, Yoon called, and the flop fell . Yoon check-called a bet of 75,000, both players checked the turn, and the completed the board on the river. Yoon checked for a third time and then called when Arieh bet 225,000. Arieh showed the for aces and kings with a five kicker, but it was no good as Yoon held the for aces and kings with a seven kicker. Hand #138: Brian Yoon raised to 100,000 from the button, Josh Arieh called, and then both players checked the flop. Yoon proceeded to check-call a bet of 100,000 on the turn before both players returned to checking on the river. Hand #139: Arieh raised to 100,000 on the button, Yoon called, and then both players checked the flop. After the appeared on the turn, Yoon bet 125,000, Arieh called, and it was off to the river. Yoon bet 400,000 and Arieh called only to muck when his opponent rolled over the for a flopped straight. Hand #137: Josh Arieh raised to 100,000 on the button, Brian Yoon called, and the flop fell . Yoon check-called a bet of 75,000 and then both players checked the turn. When the completed the board on the river, Yoon bet 275,000 and Arieh called. Yoon tabled the for a flush, and it was good as Arieh mucked his cards. Hand #132: Brian Yoon raised to 100,000 on the button and Josh Arieh folded. Hand #133: Arieh raised to 100,000 on the button and Yoon folded. Hand #134: Arieh received a walk. Hand #135: Yoon received a walk. Hand #136: Yoon raised to 100,000 and then called when Arieh raised to 250,000. The flop saw Yoon call a bet of 150,000 and then folded to Arieh's 325,000 on the turn. Hand #131: Josh Arieh raised to 100,000 and Brian Yoon called, which brought a flop of . Yoon checked, Arieh bet 75,000, and Yoon check-raised to 225,000. Arieh called and then called a bet of 400,000 on the turn. When the completed the board on the river, Yoon tanked before betting a big 875,000. Arieh leaned back, looked at his cards, and then said, "Was hoping they'd change." They didn't, and Arieh folded his hand. Hand #126: Brian Yoon raised to 100,000 on the button and Josh Arieh folded. Hand #127: Arieh raised to 100,000, Yoon called, and then both players checked the flop. After the dealer burned and turned the , Yoon bet 125,000 and Arieh folded. Hand #128: Yoon raised to 100,000 and Arieh folded. Hand #129: Yoon received a walk. Hand #130: Yoon raised to 100,000, Arieh called, and the flop came down . Arieh checked and then folded to a bet of 150,000.